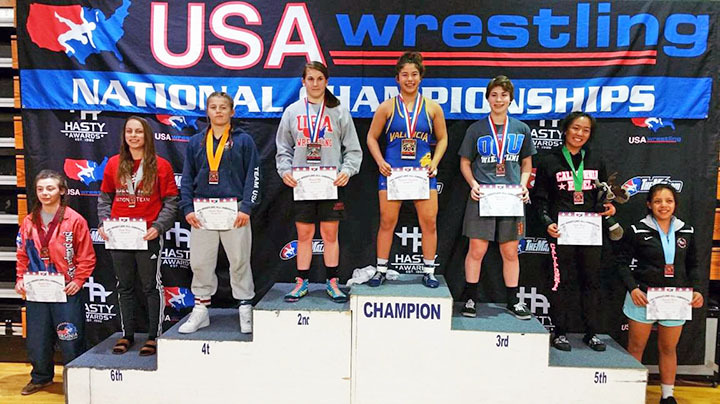 Congratulations to Valencia High School senior Gabby Garcia for both winning the girls wrestling national championship in Oklahoma this past weekend, and for being named the OC Varsity “Girls Wrestler of the Year”! Gabby won the national championship by pin in the finals. Additionally, she won CIF state titles in each of her four years at Valencia, becoming just the second girls wrestler in CIF state tournament history to accomplish this feat (note: this has only happened once in boys wrestling). All told, Gabby posted a 138-2 record in high school. Click here for the article, and congratulate Gabby when you see her. Go Tigers! Be the first to comment on "Valencia’s Gabby Garcia wins national championship, named “Girls Wrestler of the Year”"